Astronomers have spotted a planet so big it might not actually be a planet – in the hostile environment of the ‘galactic bulge’ at the heart of our Milky Way galaxy. The newly discovered planet, designated OGLE-2016-BLG-1190Lb, is the first Spitzer microlensing exoworld residing in the galactic bulge. Microlensing is very useful technique for detecting alien worlds in the inner galactic disk and bulge, where it is difficult to search for planets with other methods. It facilitates the discovery of distant objects by using background stars as flashlights. If a star moves in front of an another star, the light from the distant star is bent by the gravitational pull of the nearer star and the more distant star is magnified. Microlensing does not rely on the light from the host stars; thus, it can detect planets, even when the host stars cannot be detected. OGLE-2016-BLG-1190 was discovered in June 2016 as a microlensing event by the Optical Gravitational Lensing Experiment (OGLE) collaboration. OGLE is a Polish astronomical project based at the University of Warsaw, searching for dark matter and extrasolar planets. It utilizes the 1.3 meter Warsaw telescope mounted at the Las Campanas observatory in Chile. Spitzer observed this microlensing event a few days after its discovery. 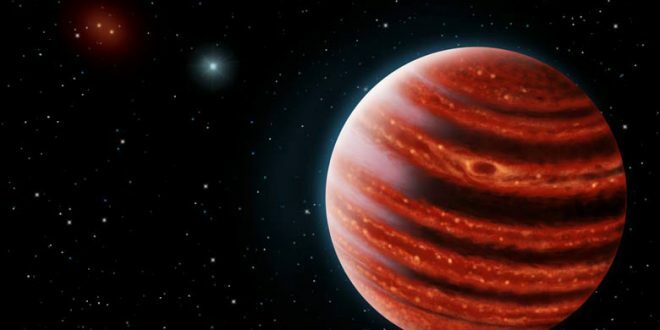 An international team of researchers led by Yoon-Hyun Ryu of the Korea Astronomy and Space Science Institute in Daejon, South Korea, reports that these Spitzer observations detected a new, massive planet orbiting a dwarf star. “We report the discovery of OGLE-2016-BLG-1190Lb, which is likely to be the first Spitzer microlensing planet in the galactic bulge/bar, an assignation that can be confirmed by two epochs of high-resolution imaging of the combined source-lens baseline object,” the astronomers wrote in the paper. According to the study, OGLE-2016-BLG-1190Lb appears to be an extremely massive planet with a mass of about 13.4 Jupiter masses. Such high mass puts the object right at the deuterium burning limit—the conventional boundary between planets and brown dwarfs. Therefore, the researchers do not exclude the possibility that the newly found planet could be a low-mass brown dwarf. OGLE-2016-BLG-1190Lb orbits its parent star approximately every three years at a distance of about 2.0 AU. The host is a G dwarf with a mass of 0.89 solar masses. The system is located some 22,000 light years away from the Earth. The authors of the paper emphasize that OGLE-2016-BLG-1190Lb is the first exoplanet discovered thanks to microlensing and the Spitzer spacecraft. Moreover, what makes this planet remarkable is that it is right at the edge of the so-called brown dwarf desert, what raises questions about whether such objects are really planets or failed stars. “Since the existence of the brown dwarf desert is the signature of different formation mechanisms for stars and planets, the extremely close proximity of OGLE-2016-BLG-1190Lb to this desert raises the question of whether it is truly a ‘planet’ (by formation mechanism) and therefore reacts back upon its role tracing the galactic distribution of planets,” the paper reads.